J Antiabong, O Owolodun, O Adefalujo, B Yakubu, M Ogedengbe, D Shamaki. Molecular Evidence Of Transplacental (Vertical) Route Of Transmission Of African Swine Fever In Foetus Of Pig: A Case Report. The Internet Journal of Veterinary Medicine. 2006 Volume 2 Number 2. African Swine Fever (ASFV) DNA was detected in the Placenta, and organs of fetuses of a sacrificed sow using the polymerase chain reaction technique. These findings suggest a transplacental (vertical) route of transmission of ASFV in the pathogenesis of African swine fever in foetus of pig and calls for attention considering its epizootiological potential. African swine fever is the only member of the newly named Asfarviridae whose genomic organization and cytoplasmic replication is similar to that of poxviridae (Salas, 1999). The genomic size of ASFV varies between 170kb and 190kb with variable regions which contains at least five multigene families (vinuela , 1985;costa, 1990). The disease was first detected in Kenya in 1910 (Montgomery, 1921) and occurred outside Africa for the first time in Lisbon (Portugal) in 1957 (Manso Ribeivo et al, 1985). The first outbreak in Nigeria occurred in Lagos between 1997 and early 1998 and was isolated by odemuyiwa et al, 1999. As the only known DNA arbovirus it cycles between ornithodorous ticks and wild pig populations (Warhogs and Bush Pigs) in Sub-Saharan Africa (Wilkinson, 1984). ASFV can be transmitted by contact as the virus is present in sufficient amounts in secretions and extractions. The virus is very stable in the blood and faeces of infected animals. Airborne transmission over short distances can also occur (Salas, 1999). The placenta is the obvious route for passage of infectious agent from mother to the offspring and for this to occur the virus must be present in the blood of the animal at the right stage of gestation and must reach the placenta and then the foetus. Transplacental infection has been reported for animal diseases such as hog cholera, porcine parvovirus, mucosal disease and equine infectious anaemia (Mims, 1981). In an experimental infection of pregnant sows ,ASF virus was recovered from foetal placenta, amniotic fluid and heart blood with specific immunoflorescence present only in the placenta tissues (Schlafer and Mebus ,1987) suggesting the possibility of transplacental infection of the foetus. In this study we show a PCR evidence of a natural transplacental infection of the foetus by the African swine fever virus. Tissue samples were collected aseptically from internal organs (liver, heart, kidney, lungs) and placenta of fetuses removed from a sacrificed pregnant sow that belonged to a piggery that recorded mortality of pigs of all ages, recumbence, anorexia, varying degrees of diarrhea, reddening of skin of affected pigs. Liver tissue was collected from the sow. 0.5g of each tissue sample was homogenized using Ultra Turrax T8 (Ika- werke®) 2mls of phosphate buffer saline (PBS) was added to each of the homogenate and then short spinned at 12,000rpm for 20 seconds in microcentifuge tubes (Eppendorf®) to obtain the supernatant which contains the virus. The genomic DNA was extracted from 100µl of the supernatants using the Tripure reagent (Roche®) according to the manufacturer's instruction. Extracted DNA was then transferred into a clean, nuclease free microcentrifuge tubes and stored at -200C for further analysis. A diagnostic PCR was performed using 3.0µl template DNA extract in a total reaction mix of 25µl. The reaction mix included 14.5µl at nuclease free water (Promega ®), 4.5µl Dynazyme buffer (1x10mM Tris-HCl pH8.8, 1.5mM MgCl2,50mM Kcl, 0.1% Triton x – 100) Promega ®), 0.5µl dNTP (10mM nucleotide mix) (Promega®), 20pMol of primers PAS1 ( sense) S1 – ATG GAT ACC GAG GGA ATA GC-31 and PAS2 (anti sense) S1 – CTT ACC GAT GAA AAT GAT AC – 31 (GIBCO brl®) which amplifies a 278bp fragment of the VP72 gene of ASFV genome, 0.5µl of Tag.DNA polymerase (Roche®). 20µl of mineral oil (Sigma®) was added to prevent evaporation. Amplification of target DNA sequence was carried out in a cyclogene thermal cycler (Techne®) at initial denaturation of 940C for 15s followed by 30 cycles of thermal denaturation (940C for 15s), reannealing (620C for 15s), extension (720C for 15s), and a final incubation at 720C for 15s to complete the extension phase of the reaction. 8.0µl each of the amplicons (mixed with 2.0µl of 0.25% orange G Loading buffer (Promega ®) were fractionated in a 1.5% Agarose (Sigma ®) gel using 1xTBE (Tris – Borate – EDTA) butter (Promega®) to which 5µl (1µg/1µl) ethidium bromide (Promega ®) was added. 5.0µl of 1kb molecular weight marker (Promega ®) was also fractioned along side the amplicons Electrophoresis was at a constant voltage of 80volts for 50minutes. The result was visualized and photographed over an ultraviolet light source using a T2202 Polaroid Camera (Sigma®). 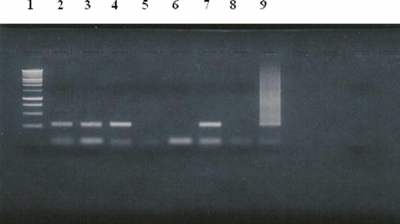 PCR analysis and electrophoresis of DNA extracted from the tissues of foetal liver, lung, and Placenta and liver of the pregnant sow detected bands which co-migrated with the positive test control (A 287bp PCR confirmed ASF viral DNA from onderspoort veterinary institute, South Africa) corresponding to the 278bp fragment of the VP72 gene which encodes a major capsid protein in the ASFV genome. These samples were considered positive for the presence of ASFV DNA. DNA extracts from the heart and kidney tissues were not amplified nor co-migrated with the positive test control and therefore indicated the absence of ASFV DNA in these tissues Fig 1. The Presence of ASFV DNA in the placenta and foetal organs of pig suggests a natural Transplacental (vertical) route of infection in the pathogenesis of the disease. As observed, ASFV DNA from the liver tissue of the sow co-migrated with that of the foetus as well as the positive test control. This indicates an active stage of infection in the sow which also presented clinical signs of African swine fever infection before being sacrificed. No ASFV DNA was detected in the heart and kidney tissues of the foetus. This could be due to the lack of receptors for viral attachment in the pathogenesis of the virus, in these organs at the time of infection. It has been shown that the presence of receptors is necessary for a productive infection of ASFV (Salas, 1999). Pigs which recover from ASFV infection are known to be carriers and this serves as a factor in the persistence of the virus. Vertical transmission sometimes play a central role in the epizootiology of infectious diseases, for instance, in cases where antigens are presented to the foetus before development of immune responses and this, regards as self rather than non-self and immune responses to these particular antigens would therefore be minimal. This might enable an infectious agent to persist indefinitely in the animal as seen in the case of mice that carry lymphocytic choriomeningitis (LCM) virus (Burnet and Fenner, 1949). Whether this principle is also applicable in the persistence of ASFV infection in pigs is yet to be proven. Schlafer and Mebus (1987), recorded abortion in sows experimentally infected with ASFV. However, in a situation where the virus persists in the foetus after being farrowed a carrier status could result. Therefore, the phenomenon of transplacental (vertical) transmission of ASFV further poses a challenge in the epizootiological control of African swine fever. The authors acknowledge the executive director, National Veterinary Research Institute for permission to publish this work. 1. Burnet F. M. and Fenner F., 1949: The production of antibodies 2nd Edi. MacMillan, Melbourne. 2. Costa J.V. 1990. African swine fever virus: G. Darai (ED.) Molecular Biology of Irridoviruses. Kluwer Academic Publishers Norwell, Mass. P247 - 270. 3. Manso Ribeivo, J.J., Rosa Azevedo, J.A., Teixeira. J. D. O., Braco Forte M.C., Rodrigues Ribeiro A.M.,Oliveiva E., Noronha F., Grare Pereira C. et Dias Vigario J.(1985). Peste Porvoguee Paraune Souch differrente (Souche L) de la Souche classique. Bull off Int. Epizoot. 50:516-534. 4. Mims C. A. 1981: Vertical Transmission of Viruses. Microbiological Review, P267 - 286, Vol 45, No.2. 5. Montgomery R.E. (1921) A Form of Swine Fever occurring in British East Africa (Kenya Colony) J. Comp. Pathol. 34: 159 - 191. 6. Odemuyiwa S.O., Adebayo I.A., Ammerlaan Wina, Ajuwape A.T.P.,Alaka O.O.,Oyedele O.I. , Soyelu K.O., Oladele D.O., Otesile: E.B., Muller C.P. 1999:An outbreak of African Swine Fever in Nigeria Virus isolation and molecular characterization of the VP72 gene of a first isolate from west Africa. 7. Salas M.L. 1999: African swine fever Virus (Asfarviridae): Allan Granoff. R. G.W. (ED) Encyclopedia of Virology Academic Press, London, pp. 30-38. 8. Schlafer D. H. and Mebus C.A. 1987: Abortion in Sows experimentally infected with African swine fever Virus: Pathogenesis studies. AM. J. Vet. Res. 48(2): 246-254. 9. Vinuela E. 1985: African swine fever. Curr. Top. Microbiology Immunol. 116: 151-170.